Gator Fixed - Drop Point, Fine Edge. 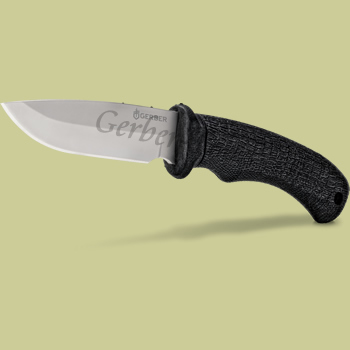 Nothing represents a hunting knife better than this USA made Gerber Gator Fixed Blade model 06904 46904. This knife comes with a 420HC stainless steel blade and the most comfortable grip on the planet. The core of the handle is made of glass reinforced nylon. The outside of the handle has a santoprene rubber overmold. This overmold is textured to give the knife a soft, tactile grip. This knife comes with a ballistic nylon sheath. A molded plastic insert is inside the sheath so your knife doesn't do damage to the sheath.